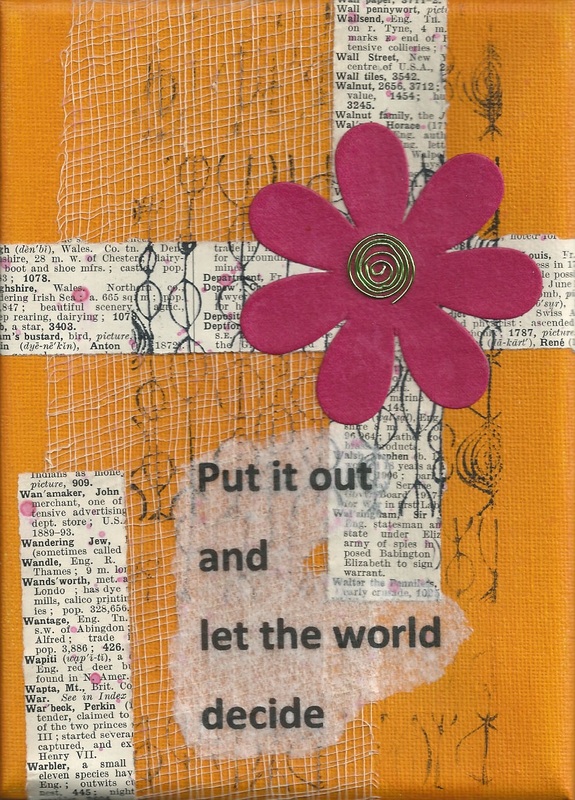 Of all the sayings on my mini inspirational paintings, “put it out and let the world decide” seems to be the one I most need to hear at the moment. I’ve been over thinking again – second guessing the future and paralysing myself into the bargain. Basically, if I stop to think, I stop! So, lately, whenever I catch myself over thinking I just remind myself that I have no idea what will or won’t work . . . or what is or isn’t the right product . . . or what is or isn’t the right quantity . . . or what is or isn’t the right price . . . or what people will or won’t like – so I might as well . 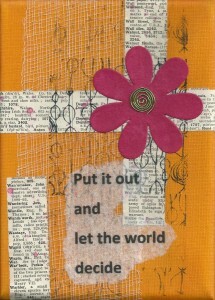 . . “put it out and let the world decide“. After SueC’s comment on my last blog post I was inspired to put together an ephemera pack to offer for sale in the online shop. It took me much longer than I would have liked but finally I got it together and worked out some fun packaging. I agonised a bit over the pricing but quickly saw that using any of the traditional formulas that take into account cost of product and time spent wouldn’t work for me. If I did that I’d have to be paying customers to buy from me since I take days to find stuff and then do something with it! Even if I paid myself minimum wage I couldn’t make a profit if I factored in my time. But I’m OK with that. I’m in the fortunate position that any money I make is a bonus. My partner takes care of the essentials and is happy for me to experiment. At some point it would be lovely to make back the money I spend on materials and even more fun to make a profit. But for now I don’t have to focus on that. So, how do I decide what to charge? For the inspirational art at the show I took a poll of what friends and family would pay if they were customers and chose a price in the middle of what they said. 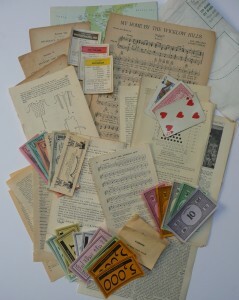 For the vintage paper ephemera I looked at what other people were charging for similar items and thought about what would make it worth the effort for me. Finding stuff is fun for me. As is designing packaging and thinking about the offer. Not so enjoyable is packing it up and taking it to Post Office so I decided that I didn’t want to do those bits for less than £10 a trip. I’d love to hear which mini painting quote is your favourite and why. Please visit the blog and leave a comment here. I can’t wait to hear what’s inspiring you! Yep. It’s the attachment to outcome that gets you every time. That’s why I’m loving the art stuff. I have no experience in that arena so it’s easier to ignore the judgements or not have many in the first place. That’s how I want to live the whole of my life. To do that we have to be willing to give up control but I’m beginning to see the benefits more and more. Not so much in the outcomes but in the peace that comes from being comfortable with not knowing what comes next. I love that – “releasing it into the wild”. It has such a great energy about it. Thanks for commenting. I just did my first big show last year and I had my little group of girlfriends over for dinner and let them price my paintings! Lovely! So much more fun than applying formulas and trying to get it right. Karen’s formula is probably the best way to go ; ) Just don’t think too long , “just release it into the wild”, it all will work out in the end.